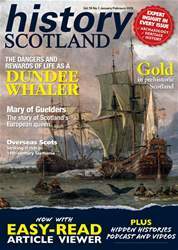 Welcome to the first History Scotland issue of 2019, although I know that many of you will be reading this in the last few weeks of 2018. There have been some really interesting history and archaeology projects and events this year. A few that spring to mind are the ongoing excavations at Orkney, the opening of V&A Dundee, heritage events and activities connected to the Year of Young People, and last but not least, the launch of the History Scotland lectures – with our next event due to be announced in the coming weeks.